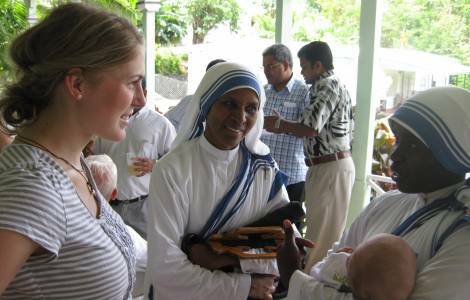 ASIA/INDIA - "To be people of Caritas means to be people of the Good News"
New Delhi (Agenzia Fides) - "Caritas is the joy of service, Caritas is a service of joy. Caritas India is the organ of the entire Catholic church to concretely express our charity and, as Deus Caritas East of Benedict XVI says, to be people of Caritas means to be people of the Good News, people who communicate the love of God": said the President of Caritas, the Bishop Lumen Monteiro, said in a recent celebration in New Delhi, where The Catholic body presented its new leadership, in the presence of Msgr. Theodore Mascarenhas, Secretary General of the Indian Bishops Conference (CBCI). As Fides learns, Fr. Paul Moonjely, the new executive director of Caritas India and his assistant Fr. Jolly Puthenpura, took charge during a solemn liturgy. Fr. Moonjely said: "Do not compare your life with others. There is no comparison between the Sun and the Moon. They shine bright when the time is right. I assure you that I too will shine bright, with the grace of the Almighty and with your support, I will endeavour to be a Diakonos, a faithful, humble servant and a steward of the Diakonia ministry. I once again affirm and declare my simple faith in the Lord. As St Paul says: I can do all things through Christ who strengthens me". Fr. Puthenpura remarked: " Caritas India is called to grow nearer to the poor of our country and their life situations. To encounter them with solidarity, to embrace them with affection and to let them feel the warmth of Christian love expressed in service".